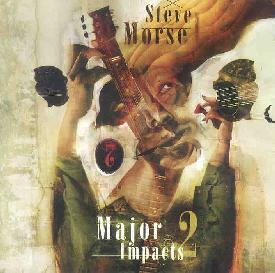 Steve Morse - "Major Impacts 2"
It stands to reason that an artist who excels at composing and performing varied styles of music to the extent that Steve Morse does would have a wide range of tastes and influences. The first Major Impacts album showcased Morse's seemingly limitless talents with a set of songs that paid tribute to some of the bands that inspired him as a musician and music fan. I considered it to be one of the freshest Steve Morse albums I'd heard in a while so I was pleased when the new Major Impacts 2 arrived. With Dave LaRue on bass and Van Romain on drums, Morse cranks out a fun set of songs that draws inspiration from a variety of bands and styles. Listeners are sure to guess that Crosby, Still, Nash & Young, The Who, ZZ Top and Lynyrd Skynryd inspired their respective tracks. "Errol Smith" is a standout tune that pays tribute to Aerosmith, and while it does have a definite "Walk This Way" boogie woogie groove it also includes all the hallmarks of classic Dixie Dregs. "Abracadab" is another great rocker, though I wouldn't have guessed it drew its inspiration from Genesis. Ditto for "Motor City Spirit", a hot rocker that notes the trio of Sprit, Deep Purple and Ted Nugent as the impact. "Organically Grown" is an excellent song influenced by ELP. It sounds like Emerson sitting in with a heavy prog rock band. Even the guitar style is a bit different for Morse. A highlight of the set. Morse also includes songs that reflect stylistic and genre influences, including Celtic Ballad, Cajun, Bach, Yardbirds/Brit Pop, and the absolutely SMOKIN country/bluegrass tribute, "Tri County Barn Dance". Morse fans are pretty well guaranteed to love this album, as will anyone who appreciates what a combination of instrumental virtuosity and passionate execution can produce. For more information you can visit the Steve Morse web site at: http://www.stevemorse.com. Split Decision is distributed by Magna Carta. You can visit their web site at: http://www.magnacarta.net.